"September is supposed to be the best time to visit Spain", a friend from Madrid said in an email, "The heat of summer should have passed, but the air still warm." After checking the car rentals and RENFE (train/rail system in Spain) schedule, I found the tour bus to be the most cost-effective and the best way to go. Soon enough we were on a flight from Paris to Madrid to catch the bus to Southern Spain. The following day, we left our very comfortable hotel early in the morning to find the tour operator office closed. So we decided to have breakfast at the restaurant next door. One hour past the scheduled departure date, the office still has not opened. I was afraid the trip got canceled. Encouraged to see a piece of luggage by the door, I went out to check if there were other travelers around. We found the owners of the luggage, a young American couple, waiting at the other side of the doorway. As the door opened, RC and I followed the young couple inside. A young gentleman followed. He was from Australia. Then an older couple (Lebanese), a young woman from New Zealand, and another American couple followed. We picked up another couple (Italians) along the way to complete the group. There were 14 of us, including the driver and the tour guide, on a 60-passenger bus. Our group was as exotic fusion as the architectural landmarks we were about to visit. Southern Spain is rich in history, art, architecture and stunning landscape. The history of Andalusia goes back a thousand years that made its cities of Seville, Cordoba and Granada colorful and enduring. In Cordoba, for example, a mosque and a cathedral came to co-exist which in our world a rare example of religious harmony. But how was that possible without controversy? Reading up on the history of Spain before my visit would have facilitated my understanding and appreciation of Andalusia. But knowing very little, I just had to enjoy the remnants of history (the cathedrals, palaces and fortresses) from an aesthetic point of view. Like poetry in motion, I could only report on the beauty of what I saw. Castanet, castanet, castanet, said the gypsies, said Garcia-Lorca. why read Neruda in Spain? I wonder about the paleness of her breast. missing you from the Sevillan cathedral. tracked its way across the palace. a crane pushes and swings. Past the land of Don Quixote (Castilla de la Mancha), we passed rows and rows of olive groves. After passing millions of olive trees we arrived in Cordoba. Our driver dropped us off at the foot of the Roman Bridge. We walked over the bridge to get to La Mezquita – a UNESCO World Heritage site and the symbol of Cordoba. Leading to the entrance was a patio with fountains and a grove of ancient olive and orange trees. Inside, columns with brick and stone horseshoe arches support a carved wooden ceiling. In the center of La Mezquita was a cathedral with frescoes and stained-glass windows. Beyond the Cathedral was a chamber called the forest of pillars (pictured below). Deep inside lies the Mihrab. The octagonal shaped interior walls were magnificently decorated with exquisite plant and leaf motif. Upon seeing the Mezquita one could discern that Cordoba was a model of religious and cultural tolerance. Where else could we find the rich traditions of Islam and Christianity combined in a single building? Where Christ on the cross was displayed between Islamic arches? But this was discernible only from an architectural perspective. According to our local tour guide, "Today only Catholic mass is celebrated in a small side chapel inside the Mezquita. The Muslims are not allowed to pray in the mosque." After exploring Cordoba, we walked back to the Roman Bridge. Greeted by dust from the reconstruction and stepping through newly hardened concrete, did not give me a feeling that I was walking over a medieval structure. But as the bus drove off, the Roman Bridge came into view, more defined. And with the Mezquita in the background, the view was spectacular. We arrived in Seville in the late afternoon in time to check-in to our hotel and have dinner. On our first night together, the group had a pre-arranged dinner at the hotel restaurant. The group had an interesting conversation over a seafood dinner that was surprisingly good. Despite the language barrier, we got to know each other better. After dinner we went to watch a Flamenco dance. Earlier that day, I was hesitant on signing up for this excursion because I thought I already saw the best Flamenco performance in Barcelona a few years back. But after our tour guide’s convincing that Seville, as the birthplace of Flamenco, should have the best production, I was sold on the idea. After all, the pride and confidence each culture infuses into their artistry should shine through every step and music. But the performance that night did not live up to my expectation. We first toured the newer side of the city – the different buildings from the Ibero-American Expo of 1929, the Maria Luisa Park and admired the tile work at Plaza de Espana. The following morning, we explored the old town with a local-guide who guided us over the maze of narrow streets of Barrio Santa Cruz and the Jewish Quarter. After the Jewish Quarter, we were pretty much left to explore the city on our own. 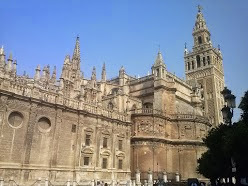 We spent the rest of the day visiting the Cathedral of Seville and the Alcazar. The Cathedral of Seville had a display of opulence that would make Beyoncé blush. The altar centerpiece was the most notable piece inside the Cathedral. It’s said to be the biggest altarpiece in the world – 20 meters high and 13 meters wide. In the uppermost part of the altar was the sculpture of Jesus reaching high to the ceiling. Its surface was covered with gold. It's believed that the amount of gold used weight over 3 tons. Although the reflecting mirror installed in the middle of the Cathedral seemed to invite visitors to take pictures of this wealth, both RC’s and my camera batteries died in Seville. Not having a camera and not being preoccupied with taking pictures turned out to be a great way of exploring a place in depth. I was able to appreciate the history and soak in the architecture and artwork. Within the Cathedral, I moved from one ornate chapel to another and stood in front of each chapel to admire Goya and Murillo's masterpieces. Another highlight of the Cathedral was the ceiling of the Great Chamber where Esteban Murrillo's painting "The Immaculate Conception" can be admired. We then climbed the Giralda Tower - used to be a minaret converted into a Catholic Church belfry. Islamic influences can be traced as we climbed the sloping walkway (equivalent to six flights of stairs) and 30 steps to reach the belfry. The view from the top of the tower was amazing. RC and I took an audio-tour of the Alcazar and its gardens. I continued on my own solitary path in the gardens at Alcazar. With renewed energy, we took the metro back to our hotel and spent the rest of the day shopping, and sipping coffee and wine, and eating jamon bocadillo at the nearby tapa bars. For a brief moment, I felt I was living the life of Sevillan. The following morning we left Seville for Ronda. The drive to Ronda offered a gorgeous panoramic view of the valley and smaller ‘blanco pueblos”. Then the bus climbed higher on a winding road to a craggy, limestone mountain. It was an exhilarating ride. Ronda seemed to be perched on a craggy mountain that gave it a unique character. It had 2 famous attractions: the New Bridge (Puente Nuevo) that spans its gorge, and the Plaza de Toros (the oldest bullring in Spain). The New Bridge connected the medieval part of town to the newer part of town. The New Zealander, the Australian, RC and I decided to have coffee at the Café perched on the cliff before lunch so we could enjoy the view of the bridge, the gorge and other buildings perched on the cliff. Ronda was a small and lovely town that a leisurely stroll was the perfect way to explore it. Behind the Plaza de Toros was a park with a lookout (mirador) and walkways. We walked along the edge for views of the gorge and the surrounding valley. The landscape was simply amazing. Before heading back to the bus, we stopped at a small restaurant outside the tourist center and had a different version of a jamon bocadillo for lunch. It was a pork sandwich nonetheless. At the restaurant the night before we left for Ronda, I heard our driver Ramon talked about taking us on a scenic route. Perhaps something got lost in translation or I didn’t know if it was by design that our driver took us on a detour up into the mountains of Sierra Bermeja and made a U-turn on a very narrow road high above the sierra. But to make a long story short, the road took us to Gibraltar. Gibraltar was not part of our itinerary, but there was a tour available for 55 euros. In the spirit of adventure I joined the tour. After a formal custom entry check, we were greeted by an Englishman, our driver and local tour guide, who led us to his van. We were no longer in Spain! We were in a British territory – the southernmost point in Continental Europe. We first stopped by the lighthouse to see the view of the ‘Rock’ from below. We could see the Moroccan coast, Africa, shimmering in the heat haze. As the van took us to the top of the rock, our driver/tour-guide gave us some background about the place and a warning to keep our eyes peeled for monkeys that inhabit the rock. We spent a few hours exploring the cave of Gibraltar and avoiding the pesky monkeys. We arrived in Costa del Sol in the late afternoon to discover a stretch of seaside town lined by new development. It seemed to have the ruggedness of Santa Cruz beach, yet it had an old world feel. Perhaps it was the hotel that we stayed in – the Hotel Las Piramides – and its décor. Our final destination was Granada, yet another city dominated by its imposing alcazar (palace/fortress) – the Alhambra and the Generalife Gardens, another UNESCO World Heritage site. Like the Mezquita in Cordoba, this place is very rich in history. The Moorish art and architecture are stunning and a feast to the eye. The Alhambra is a labyrinth of building complexes. The 3 most notable are: The Hall of 2 Sisters which is covered in decorative tiles from wall to ceiling with a vaulted ceiling that’s remarkable. The 2nd most interesting hall was the “Hall of the Ambassadors” where the pattern covering the entire wall was Arabesque. Plants and geometric patterns engraved around Arabic letters seemed to go on endlessly. The canopy, with mother of pearl inlaid on cedar wood, represents a starry night. The 3rd was the “court of the lions." The courtyard represents dessert oasis where the narrow pillars were a symbol of palm trees. Water also came from the mouth of the lions. Speaking of history, one the most prominent residents of Granada was the poet, Federico Garcia Lorca. So it was only natural for one of my traveling companions, RC the poet, to not miss the Federico Garcia Lorca museum. RC, CC and I explored the city on foot. After visiting the Federico Garcia Lorca museum in San Vicente Park, we walked across town, to the Cathedral. However, the rain stopped us from reaching the Cathedral. We stopped at a nearby tapa bar to take shelter from the rain, but ended up spending a few hours at the bar and enjoying many a serving of tapas. Granada is a university town and is lively at night. RC’s friend from school recommended that we try the restaurants in Albaicin, so we went back to the Cathedral Plaza and walked through the street leading to the Albaicin. Our path narrowed to a livelier and busy street, lined by Arab shops, restaurants and tea salons. We passed a young crowd enjoying the night out at Calle Elvira. According to our map, this street should lead us to San Nicolas Plaza – the best place to see and get fantastic night shots of the Alhambra palace. As we walked farther we seemed to have left the crowd behind, the street became narrower and darker. We found ourselves wandering in a residential area. A professorial sounding woman came out of nowhere to tell us that it wasn’t safe to be walking in this area at night. She warned, “…there was an incident here not too long ago”. The warning coupled by an eerie dog bark, scared the wits out of me. But we had already walked so far to go back down. Thinking that the plaza should not be that far, we continued on. The view of the Alhambra palace at night from San Nicolas was stunning indeed. I did not see anybody talking pictures, so I assumed there were no other tourists but us. But I saw a few young people smoking pot. Time to heed the English woman’s warning... We walked to the livelier streets behind the San Nicolas Church to catch the bus back to the city center and our hotel. For more information on Rachelle Cruz's work, please visit http://www.racruzzo.wordpress.com/. Pablo Neruda’s poem ‘The Eight of September’ inspired me to write this blog.